In pursuit of health through research in blood and blood-related processes. The ATP-binding cassette (ABC) super-family of proteins is one of the largest families of proteins to have representatives in all living organisms from prokaryotes to humans. Superfamily members consist of an ABC motif that catalyzes ATP hydrolysis to power the transporter and a trans-membrane domain that regulates substrate selectivity. ABC transporters are responsible for the transport of a variety of molecules across cell membranes including lipids, cholesterol, peptides, bile salts, ions, steroids, and diverse drugs and have been shown to be critically involved in immune deficiency, cancer progression, cystic fibrosis, and cardio-vascular diseases. The ABC genes are further grouped into 7 subfamilies (A-G). Prof. Wilfred Jefferies’s lab has discovered an essential role for an unusual member of this ancient and diverse superfamily – ABC family F member 1 (ABCF1). ABCF1 is the first ABC family member discovered that lacks a trans-membrane domain. It is primarily known as a regulator of translation induced by inflammation and has been associated with the pathophysiology of autoimmune pancreatitis and rheumatoid arthritis. However, the function of ABCF1 remains elusive. In adult Abcf1+/- mice, ABCF1 promoter activity (shown in blue) was observed in A) renal cortex, B) liver, C) small Intestine, and D) heart. This activity was also seen in almost all other tissues. Using gene-trap mutagenesis, we found that the under-studied ABCF1 is widely expressed in almost all mouse tissues and cells that are actively regenerating. Furthermore, ABCF1 is required for embryo survival at a very early stage of mouse development. Our findings, recently published in PLOS One , demonstrate that ABCF1 has an essential role in mammalian development. ABCF1 is widely expressed during embryogenesis and in adult organs: We used mice with one wild type copy of the Abcf1 gene and one “gene-trapped,” functionally null copy of Abcf1, coupled with reporter beta galactosidase (Abcf1+/- mice), to track expression of ABCF1 during embryogenesis and in adult mouse tissues. The gene-trapped mice appeared developmentally normal and ABCF1 expression was observed in blastocysts (pre-implant embryos) and in all organs examined during embryogenesis including the liver, heart, neural epithelium, and dorsal root ganglion. ABCF1 promoter activity was also seen in many adult organs like renal cortex, testis, cerebral cortex, liver, lungs, spleen, and small intestine. All these organs show some degree of active re-growth or turn-over in adult mice, suggesting that ABCF1 also controls regeneration in adult mice. 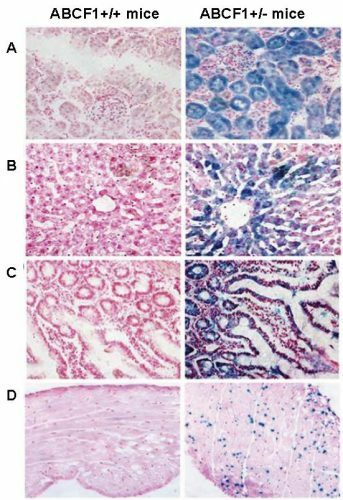 ABCF1 is essential for development at an early stage of embryogenesis: Adult Abcf1+/- mice are fertile and showed no significant differences in their anatomy when compared with their wild type littermates. Strikingly, we also observed that, in the absence of functional ABCF1 (Abcf1-/- mice), embryos were not viable beyond embryonic day 3.5 (thus Abcf1-/- mice were never born). Impact and Next Steps: Our work provides an insight into the control of the Abcf1 gene expression during embryogenesis and in regeneration of adult tissues. Importantly, functional ABCF1 expression is essential for the implantation of blastocysts – a very early stage of mammalian development. Although we detected ABCF1 and beta galactosidase fusion expression in all tissues we examined in Abcf1+/- mice, identifying specific organs and tissues that contain the highest level of Abcf1 promoter activity will lead us to a better understanding of the molecular function of Abcf1. Wilcox SM, Arora H, Munro L, Xin J, Fenninger F, Johnson LA, et al. The role of the innate immune response regulatory gene ABCF1 in mammalian embryogenesis and development. PLoS One. 2017;12(5):e0175918. doi: 10.1371/journal.pone.0175918. PubMed PMID: 28542262; PubMed Central PMCID: PMC5438103.